During the famous Salem Witch Trials (1692-93) British born Puritan soldier, Gideon Cain aided the inquisitions, believing them to be just. Soon thereafter, God revealed to Cain that he and the righteous citizens of Salem had been duped by a cunning, ageless demon from Hell known as Azazel. The guilt of his actions weighs heavily on his conscience and rather than be driven mad by it, Gideon chooses to make atonement. Taking up his sword, the blade inscribed with holy runes, he bids farewell to his wife and children and departs on his sacred mission. Now he wonders the earth doing God’s work and destroying evil in whatever shape or guise it appears; his one consuming goal, to find and destroy Azazel. Now, I don't think this qualifies as out-and-out plagiarism, of course. Sure, he's a British Puritan soldier who wields a mystical weapon, wandering the earth doing God's work and destroying evil in whatever shape or guise it appears, whose first name is evocative of a wise Biblical figure and last evocative of another Biblical figure that happens to commit the first murder... Erm... what was I saying? Oh, right, this is totally not a Solomon Kane expy. No siree. I mean, come on, he has a family, he's a century late, his sword has holy runes, the Almighty himself has set him on his quest in person, and he has a demonic nemesis. And he wears brown instead of black. That's totally different, right? Right? Still, I can't help but feel this is seriously pushing it. Citing Kane as an influence doesn't defer the fact that this Gideon Cain fellow is really, really similar. If nothing else, that name is just too close. I wonder how Paradox/CPI would react to a new character, Niall the Savage, black-haired, green-eyed, axe in hand, who was a thief, pirate and adventurer in a prehistoric age lost to modern times, and became the king of the most powerful civilized land by his own hand? But no, it totally isn't Conan, because see, he only has one eye, and his family was killed by the evil wizard Thoth-Amo- I mean, Roff-Anom! Homage or Ripoff... I'm unsure still. Guess we'll have to wait and see. Oh, Gideon Cain is totally a Solomon Kane expy, if I understand the term right. Not really "my creation," though -- I was part of the group that made him up, but not the driving force, nor one of the writers who's done stories about him. I'm one co-creator among many. Van Plexico and some friends wanted to do a Solomon Kane-like character, and we wound up talking it back and forth on an e-mail list, and I made a bunch of suggestions as to how they could get what they wanted while making him distinctly a different character at heart. I did suggest different names, as you'll see if you read my introduction to the book, but Van liked "Cain," so he went with it. But I pushed for the Salem connection, the family, the ways a post-Cromwell Puritan would be very, very different from a pre-Cromwell Puritan like Kane (Puritanism underwent a big change in that hundred years) and suchlike. Still, the impetus was definitely to create a character in the mold of Solomon Kane, and that's precisely what they did, much like August Derleth created Solar Pons so he'd have a character he could write Sherlock-Holmes-like stories with, Max Allan Collins's early Nolan novels are rooted in Westlake's Parker novels, or Lawrence Block's Chip Harrison books are comic Nero Wolfe pastiches. It's a longstanding tradition. I don't think Gideon's raconteurs went beyond the bounds of influence, but I guess that's up to those who read the stories to judge; I'm looking forward to getting my copy of the book. As for Niall the Savage...sword and sorcery fiction is littered with characters like him -- check out Lin Carter's Thongor sometime. Thief, pirate, slayer, barbarian from the north, it's all in there. And there are plenty more. I think there was even one named Crom. No one would stop you. Now, if Niall scaled the Tower of the Rhinoceros and liberated the space-god Bag-Sosha after fighting panthers and giant centipedes, you might have a problem, but from what I know of Gideon Cain's adventures, they haven't done that sort of thing. Hello Kurt, very kind of you to drop by! I apologize for pinning this all on you when this is a collaborative creation (I should've made that clear), and you helped put things into more perspective. I am appreciative that you pushed for the very different manner of Puritanism over the century since its foundation and Cromwell's revolution, which should help distinguish the character a bit more. 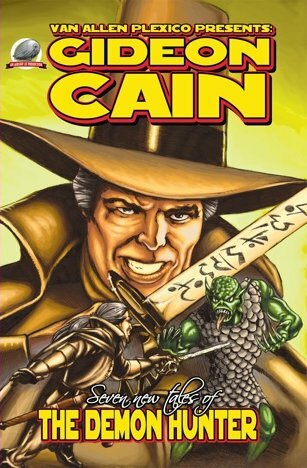 I still have a bit of grumbling about Cain - the name, mostly, which reminds me of the whole Deathstroke/Deadpool, Slade Wilson/Wade Wilson thing, though obviously far less objectionable - but if nothing else, it's nice to see expies of a Howard creation other than Conan for a change. For some reason, I now want to see someone attempt "The Tower of the Rhinoceros..."
I once wrote a story called "Tower of the Hedgehog" featuring a theif/pirate/slayer named Roland the Red. Amazing Stories rejected it soundly and gave me a literary drubbing that I never forgot. I was very (very) young at the time. It was Gardner Fox who created "Crom the Barbarian," for early 1950s comics. Later, in prose, he created Kothar, Barbarian Swordsman, one of whose adventures was adapted by Roy Thomas into a Conan tale. So did the Tower of the Hedgehog hold the imprisoned space-god Dinns-Dayle? tower of the hedgehog.. awesome..